Oculus Rift owner here. When I start the game in the Rift, I'm perpetually stuck in the black screen with the hourglass. Sound is playing through the Rift headphones though. Not sure what I'm doing wrong here? Should I start the game with a certain command line? How do you start it in VR mode? Ok, made sure that my rift was hooked up and steam VR was running and yeah, stuck on 'waiting for vrserver.exe' intermediate screen. Hi! At the moment, VR support is only ingame. Try to press 'o' ingame to toggle (May need some toggles to work). Thanks! Will try this out later. I've tried pressing O while ingame, both in first and third person but it does nothing. Before I consider this a bug, do I need to have a Rift connected for the toggle to work? I currently own a Vive so that might be the problem. I too am a Vive owner. I'll check out VR support in a few hours when I get off work. Hmm.... I got it working with the Rift and the Vive. For the vive, you may have to NOT enable VR mode in Steam, then press 'o' ingame. If it's still not working I will take a deeper look into it in the next days. So I managed to start the game in VR. 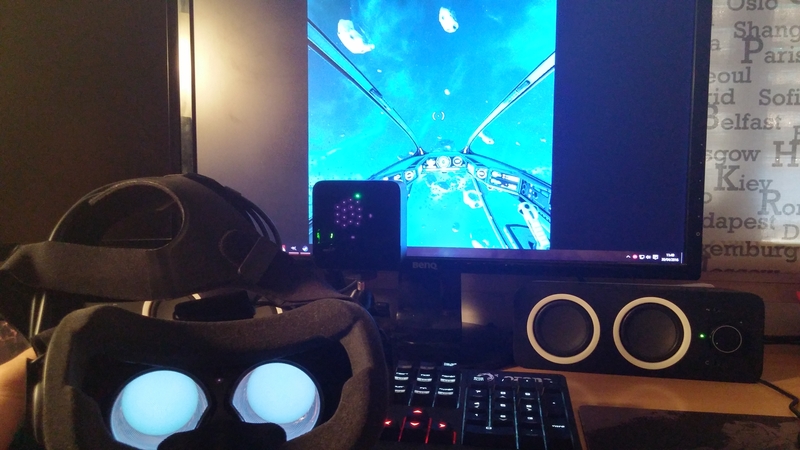 I just placed one of the base stations on my desk, set it to channel A and then started the game without having SteamVR running. After pressing 'o' the game actually switches to VR mode, however I don't get any tracking and the headset screen is just gray. Within Steam, in the game's properties, uncheck "Use Desktop Game Theatre"
so its work fine with HTC vive ? Thanks Rejaku. Very helpful. Keep rocking on ACG chin wags. Also just verified the same steps work for the DK2. Don't have a CV1, but I assume it works just the same. Crosshair is the only working HUD element in VR, tutorial popups and the menu are not compatible yet. Small world is seems, and I'm planning to.